Well, I’ve been ignoring the blog again, mainly because I’ve, once again, been eating a lot of things that I have written about before and which I count as comfort food. I always think of lasagne as comfort food. It is the way that the soft pasta, creamy bechamel sauce and meat ragu combine together to form something that is utterly delicious and such a joy to eat. 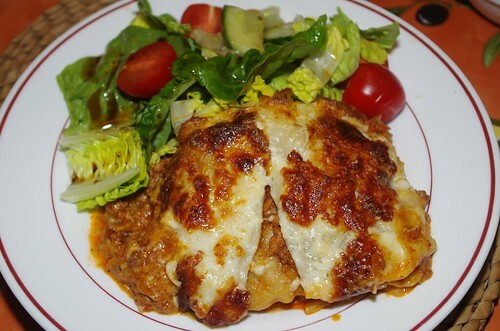 I have made lasagne with just beef mince and with various mixtures of meats but I think that the best ragu should contain beef and pork mince, plus something cured, ideally, I think, pancetta. For a real depth of flavour you need a proper soffritto of carrots, celery and onions in a small dice as well and this needs to soften in olive oil before you add the meat. I don’t think that the meat needs to brown too much, but it does need a long slow cook, and I think that you need some wine in the pot with the meat and tomato passata. For flavourings, I think that garlic is pretty much essential, as is dried oregano, salt and pepper. I also add milk into the ragu while it is simmering. It gives the finished sauce a lovely silky quality. Anyway, I am sure that there are hundreds of different recipes for meat ragu and I am happy to experiment.